Rotary Blood Bank New Delhi organized a Walk for Blood on December 5, 2010 Rajpath, New Delhi. The Walk was flagged off by Dr. Montek Singh Ahluwalia, Deputy Chairman, Planning Commissionwho walked the entire route along with his wife Dr. Ishar Ahwalia . Nearly 6000 students from 40 schools and colleges wearing white Tshirts with logos and messages on Blood Donation and red caps participated enthusiastically in the Walk. 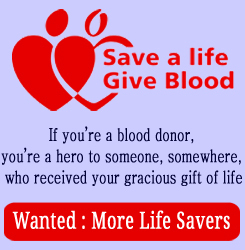 The students carried placards with exhortation on Blood donation and also chanted slogans on Blood Donation. Over 600 Rotary members including their spouses participated in the Walk.Director-elect Yas Das and his gracious wife Manju Das came from Ambala to be a part of this Walk. Three CWG gold medal winners Ashwini Ponnappa (Badminton) Anisa Sayyed (Shooting) and Krishna Poonia (Discus throw) participated in the Walk and encouraged the other participants to work for creating awareness and encouraging their friends and family members to donate blood. Other celebrities who spoke on the occasion and joined the Walk were Padma Vibhushan Dr. Sonal Mansingh, Padma shri Saroja Vaidyanathan, Padma shri Shovana Narayan, all three eminent danseuse. A prominent social activist Ms. Nafisa Ali spoke on the occasion and joined the Walk. The enthusiasm shown by the participants was to be seen to be believed. The Event was widely covered by the electronic and print media. Over 20 news papers carried photographs of the Walk with several of them giving a write up on the Walk. The message was widely disseminated with participants from 40 educational institutions and coverage in the press and electronic media. Ms. Aradhana Johri, Joint Secretary with the National Aids Control Organisation spoke on the occasion emphasizing the need for Voluntary Blood Donation to save precious human life. Mementos were given to Rtn. PP Atul Jain, Rtn. PP Ajay Chauhan and PP Kamal Bhambani who helped organize a number of Blood Donation camps. Kamal Bhambani donated blood 60 times till date. All three of them committed to enhance their targets significantly for the next year. Speaking to the media, Past Director and President Emeritus Rotary Blood Bank Rtn. Sudarshan Agarwal stated that Blood donation creates a compassionate, caring and egalitarian society which is the need of our time. 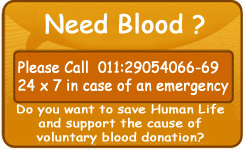 Blood donors are loving, unselfish and compassionate human beings. The Rally was sponsored by ONGC, Steel Authority of India, Pearl Infrastructure Ltd., DLF Foundation, Bhilwara Industries, Modi Foundation, Insignia, Godfrey Phillips and NACO.